Crumbs and Cookies: twice baked shortbread. Baking cookies isn't really my top priority. Cakes always steal the limelight, especially sky high layer cakes with a thick slathering of frosting. Yum. But there's only so often you can make such cakes, and when I'm itching to bake something, I have to think of stuff that is a little less indulgent and suitable for everyday nibbling. And that's what cookies are for no? This shortbread recipe caught my eye because it adopts an unconventional baking method for its kind. 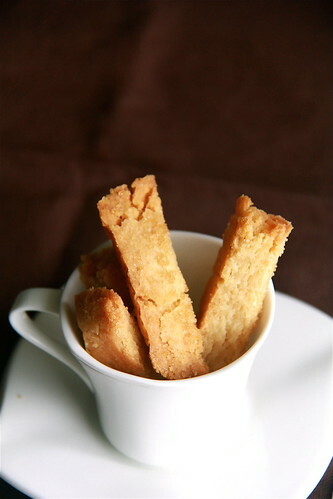 It uses the way we bake biscotti, which is to bake it at low temperatures, twice. The first to cook the dough through, the second to dry it out and make it crisp-crunchy. This is perfect because I always lament the lack of crunchy as shortbreads are often to tender to do more than crumble away in your mouth. 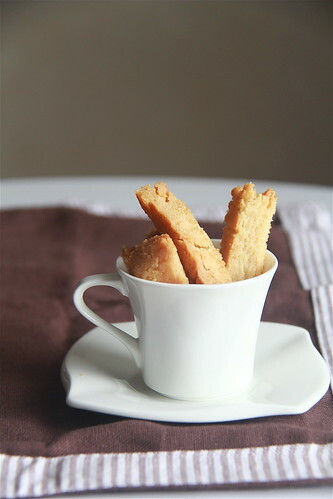 These shortbreads are indeed crunchy, buttery and delicious and fabulously easy to make. In fact, I didn't bother transferring the butter to another bowl to mix it with the other ingredients. I did everything in a saucepan! In a medium bowl, combine the melted butter, sugar vanilla and salt. Add the flour and mix until just incorporated. Pat the dough evenly into an foil-lined 8 inch square pan. Let it rest for at least 2 hours or overnight (no need to refrigerate). Position a rack in the lower third of the oven and preheat the oven to 300F. Bake the shortbread for 45 minutes. Remove pan from oven, leaving the oven on. 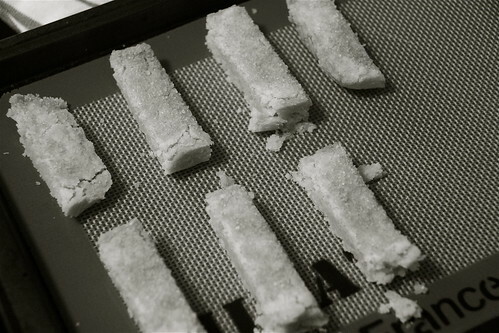 Lightly sprinkle the surface of the shortbread with the coarse sugar. Let the shortbread cool for 10 minutes. 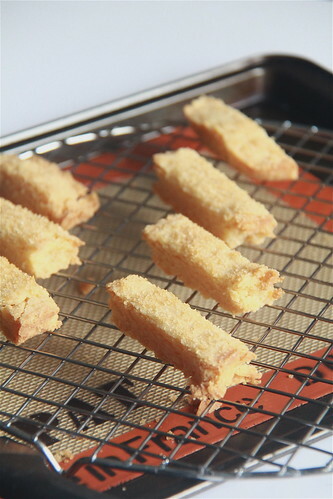 Remove shortbread from pan and cut it into oblong "fingers" or squares. Place the pieces slightly apart on a parchment-lined baking sheet and bake for another 15 minutes. Cool on a rack before storing. These look delicious, Amanda! They almost remind me of biscotti - yum! chocolate chip almond cookie dough brownies. cook's illustrated's ultimate chocolate cupcakes. ultimate chocolate cupcakes in the making. pistachio waffle with bitter chocolate cream. pierre herme's macarons- paris match.